Model 1600 six-cylinder sedan with radio and heater. Engine: L-Head straight 6, 245 cubic inches. Synchromesh 3-speed transmission. 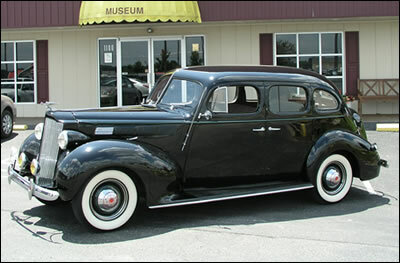 Wheelbase was increased from 115 inches to 122 inches on the Packard Six for 1938. During the depression of the 1930’s, it was the “Junior Packards” that saved the company. The famous Packard 120 Series was introduced in 1935, which enabled Packard to enter the mid-price field. Then, as a model in the “Junior” Series, a powerful six was added in 1937, bringing the price down still further to under $1,000. In 1938, the six-cylinder engine was increased to 245 cubic inches and 100 horsepower, with greater low speed torque. The car you see here is surprisingly nimble and responsive on the road. Retaining the classic Packard look, the Junior Packards were popular cars. There was a lot of prestige that went along with owning a Packard; and in those days, the kind of car you drove, pretty much established you on the social ladder. If you drove a Packard, people did not have to ask or wonder how you were doing…they just knew!